Primavera (Allegory of Spring) II - Botticelliis based on the famous painting by Sandro Botticelli from 1482. Here in this most famous Renaissance art work, Primavera or Allegory of Spring by Botticelli, we see a group of mythological creatures in the scene. In the center is Venus goddess of beauty and love with an angel above. Surrounding her from left to right is Mercury picking fruit, the Three Graces which represent charm and beauty, Flora who is surrounded by flowers on her robes, and then Chlorys the nymph of Spring and Zephys the bringer of spring and summer breezes in an eerie rendition. This piece is remarkable for its rich composition and use of color and textures in the gowns. 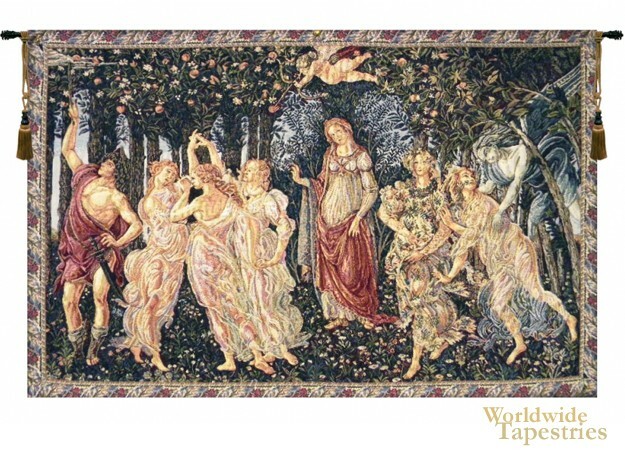 This Renaissance tapestry Allegory of Spring is backed with a lining and a tunnel for easy hanging. Note: tapestry rods and tassels, where pictured, are not included in the price. Dimensions: W 25" x H 37"